Imagine living in a neighborhood of elegant homes, just a short walk from the ocean, with all of the great amenities of a Grande Dunes community. 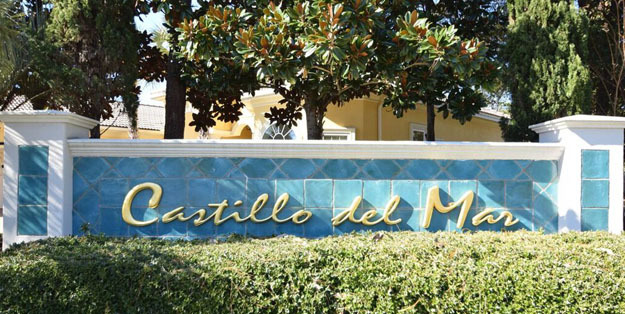 Castillo del Mar is that neighborhood! Located at the north end of the property, nearest to the beach, it is one of the most popular subdivisions in the Grand Dunes family. Here, homes never stay on the market for very long. Read more about Castillo del Mar at Grande Dunes real estate. Extraordinary Mediterranean-style that has become the signature of any Grande Dunes community is evident in the Castillo del Mar neighborhood. The homes are large, at 2800 to over 4000 square feet in size, and have all the luxury upgrades you can imagine. Many homes feature spectacular outdoor entertainment areas with cooking facilities, pools, and hot tubs, surrounded by lavish landscaping. Prices run from the mid $800,000's to over a million. Homeowners enjoy membership at the Grande Dunes Ocean Club which is available to all residents. They can stroll to the stunning clubhouse at the beach and dine with a panoramic view of the ocean, have a drink with friends in the lounge, swim in the enormous oceanfront pool or take advantage of the private beach access, and much more. Call our Grande Dunes expert, Greg Harrelson, (843) 536-8383 for a private showing of any Castillo del Mar home for sale.